The old adage "You get what you pay for" applies in most situations. Apparently not in the NFL. 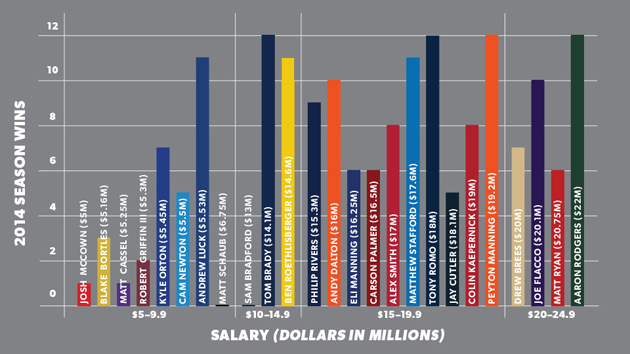 With the 2014 season in the books, SI.com compiled a list of the 25 highest-paid quarterbacks in terms of yearly average salary (data via Spotrac.com) and charted how they fared, as measured by wins. Some of the results were expected. Aaron Rodgers, currently the highest-paid signal-caller in the NFL, is tied for the NFL lead among quarterbacks with 12 victories. Joining him at the top of the standings: Peyton Manning (No. 5 on the salary ranking), Tony Romo (No. 8) and Tom Brady (a bargain at No. 16). Others surprised. NFC South quarterbacks looked egregiously overpaid this season, with Matt Ryan (the NFL's second-highest paid quarterback), Drew Brees (No. 4) and Cam Newton (No. 20 as he's still on his rookie-scale contract) all tallying seven wins or fewer. Jay Cutler's deal (his $120M extension made him the fifth-highest paid quarterback) looks so bad that Phil Emery, the Bears' GM who gave it to him, lost his job. Two quarterbacks (Sam Bradford and Matt Schaub) were paid nearly $20M combined last season ... and won zero games. Bargains do exist. Andrew Luck, who won 11 games, ranked 19th among all quarterbacks in pay. Recently retired Bills QB Kyle Orton won seven games for Buffalo, but didn't even crack the top 20 in salary. Find a full list below.